STOW, OH, August 21, 2017 - Looking for the perfect music-related gift for students going back to school, or for holiday gift giving? Look no further than Audio-Technica's ATH-SR6BT Wireless Over-Ear High-Resolution Headphones and ATH-DSR7BT Wireless Headphones with Pure Digital Drive technology both of which deliver superior sound quality via Bluetooth wireless technology and are currently available at select Best Buy stores and on BestBuy.com. The ATH-SR6BT combines outstanding audio quality from any music source with the convenience of cable-free operation and a compact foldable design. The ATH-DSR7BT is one of the first Bluetooth headphones to employ Audio-Technica's exclusive Pure Digital Drive system, which keeps the audio signal completely digital from source to driver to offer never before-available wireless headphone sound quality. Both models are ideal for use with smartphones, portable music players, tablets, laptops and other Bluetooth wireless devices. Available exclusively at Best Buy and on BestBuy.com, the ATH-SR6BT (US$199.00) employs aptX sound-improvement technology, specifically created to yield improved audio performance over a Bluetooth transmission. Connecting to the ATH-SR6BT is simple thanks to its NFC (Near Field Communication) functionality. Just touch any NFC-compatible device to the "N" logo on the headphones and the device and headphones are automatically paired and connected. The ATH-SR6BT includes a built-in mic and controller for answering calls and controlling volume and music playback and its high-fidelity condenser mic provides clear, intelligible audio quality during phone calls. The headphones' large-diameter drivers and wide-range 5 Hz - 40,000 Hz frequency response deliver clear, immersive sound. The ATH-SR6BT supports aptX and AAC wireless codecs (as well as the SBC format). The ATH-SR6BT can also be used as a wired headphone and offers Hi-Res Audio performance when used with its detachable 3.9-foot cable. The ATH-SR6BT also comes with a USB charging cable and a carrying pouch and its built-in rechargeable battery provides up to 30 hours of convenient wireless operation. Audio-Technica's ATH-DSR7BT over-ear headphones incorporate the new Pure Digital Drive system, a groundbreaking technology that uses the proprietary Dnote chipset instead of the typical D/A converter and amplifier, which require the audio signal to go through multiple processing steps that can introduce distortion. With the ATH-DSR7BT's Pure Digital Drive system, the audio signal is kept entirely in the digital domain from the source right through to the driver, resulting in purer, more accurate musical reproduction with exceptional fidelity, resolution, imaging and dynamic impact. The ATH-DSR7BT (US$299.00) employs a 45 mm True Motion Driver with a lightweight voice coil and a specially designed diaphragm to improve the driver's transient response. A pair of acoustic resistors controls the airflow around the diaphragm to ensure a natural, balanced sound, and a layered aluminum housing reduces unwanted vibration and controls internal airflow for maximum audio clarity. The ATH-DSR7BT supports aptX HD, and other codecs at up to 24-bit/96kHz (up to 24-bit/48kHz signals in Bluetoothmode). It features NFC functionality and a built-in mic and controller for answering calls and controlling volume and music playback. The ATH-DSR7BT is able to deliver Hi-Res Audio compliant playback from audio sources when connected via its included USB cable. Like the ATH-SR6BT, the ATH-DSR7BT features a rechargeable battery and soft formfitting foam earpads and a padded headband for total long-wearing comfort. Click here for ATH-SR6BT product profile and downloadable high-res photos. Click here for ATH-DSR7BT product profile and downloadable high-res images. Speak Up for Great Music! SAN FRANCISCO, CA, August 17, 2017 – Monster Products, the global leader in personal audio innovation, and Speak Music Inc., the voice and AI driven personal music platform, today announced the launch of the world’s first voice-powered premium headphones. 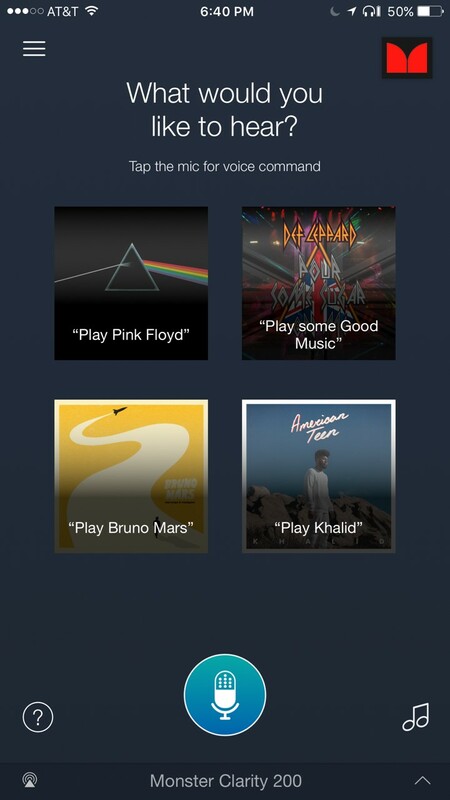 For the first time, you can literally tell your headphones what music to play, ask for a particular song, artist, genre or playlist – enjoying a truly hands-free listening and control experience. You can also tell your headphones to access iHeartRadio, Spotify Premium and soon to be available TIDAL (including support for TIDAL HiFi, TIDAL's lossless CD quality service), NPR news briefs, as well as iTunes local music. Now included in the new MonsterTalk™ family of voice-controlled music products are Monster’s top of the line Elements headphones, the popular Clarity HD line and the critically-acclaimed iSport Freedom V2 fitness model. Each of these MonsterTalk voice-controlled models features Speak Music’s voice-powered AI music assistant, Melody. The new voice-powered models will be available to consumers later this month. For almost 40 years, Monster® has been a catalyst for innovation and big ideas. Discovering that cables in hi-fi systems influenced the sound, Head Monster Noel Lee developed Monster Cable - an immediate hit. Monster® engineered the sound of Beats® headphones, and has since become the world’s leading manufacturer of high-performance headphones, all featuring Pure Monster Sound™ technology. Today, the company offers advanced connectivity solutions for professional musicians, home entertainment, computing, mobile and gaming, as well as high performance AC Power and conditioning products. Monster® continues to lead in innovation with Monster having been granted over 500 Patents and 100 patents pending worldwide, offering more than 5,000 products in over 160 countries. Monster® also prides itself in helping those who are in less-than-fortunate circumstances through Monster Cares. Above all, Monster® does what it does Because the Music Matters. Explore the world of Monster at www.monsterproducts.com. To become a fan of Monster products, please follow us on Facebook (www.facebook.com/monsterproducts), Twitter (www.twitter.com/monsterproducts) and Instagram (https://www.instagram.com/monsterproducts/). Fountain Valley, CA – August 14, 2017 − Kingston Digital, Inc., the Flash memory affiliate of Kingston Technology Company, Inc., the independent world leader in memory products, has added 4GB and 8GB capacity sizes to its family of DataTraveler 2000® encrypted USB Flash drives. The smaller capacities join the existing 16GB, 32GB and 64GB models, and are all FIPS-197 certified. All DataTraveler 2000 drives offer 256-bit AES hardware-based encryption and PIN protection with access through an onboard alphanumeric keypad. DataTraveler 2000 drives are designed for global security IT professionals, small-to-medium businesses and corporate end users who require data protection in a USB. As the drives are OS independent (compatible with any device with a USB 2.0 or USB 3.1 Gen 1 (USB 3.0) port, they are easily deployable in work environments where multiple devices and operating systems are in use. Each drive is protected with 256-bit AES hardware-based encryption and no software or hardware drivers are needed. DataTraveler 2000, as well as Kingston’s full line of encrypted DataTraveler and IronKey USBs, is backed by a five-year warranty, free technical support and legendary Kingston reliability. For more information visit www.kingston.com. Taipei, Taiwan, August 15th 2017 - The leading global motherboard manufacturer, ASRock®, is pleased to announce is pleased to announce the X10 IoT router, a unique next generation smart IoT hub that is designed as an integral part of a smart home environment and essential part a secure domicile. 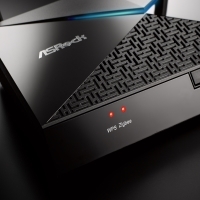 As an IoT router, the ASrock X10 is well equipped to control various “Smart Home” devices, including light systems like smart lighting devices, smart locks, smart water meters, television, air-conditioning units and much more without requiring any additional hubs thanks to its ZigBee controller and advances mesh networking technology. 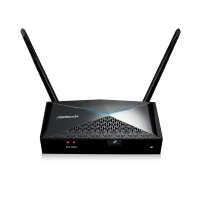 As an access point, the ASRock X10 is very capable, supporting AC1300, equipped with high-gain antennas and supporting MU-MIMO and beamforming, thus providing excellent coverage and high bandwidth for any user connected. As a home-router, it supports parental control, works as a secure VPN server and enables you to access your files at home anywhere around the world thanks to M2M (machine to machine) technology. 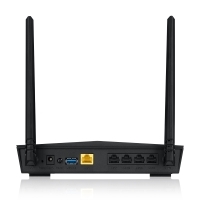 The ASRock X10 IoT router can be controlled through the ASRock Router app. The app, which is available on Google Play Store or the App Store for iPhone® and iPad®, both gives complete control of the ASRock X10 IoT router, as well as any smart devices in your home. It smoothly discovers new devices in your home, allows you to add IR devices through a cloud-based database, or learn directly from the device, and control every smart device through your smartphone. You can choose to control each device manually or add scenes, which set a group of devices up for your desired activity, like turning off all lights and closing the curtains when you go to sleep, turn on your TV, home entertainment system, and set mood lighting when you want to watch a movie, or open the blinds, lights, and power on your coffee maker to wake up in the best way possible. 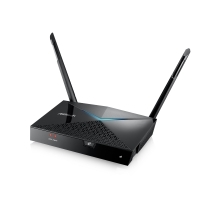 As an added bonus you can control multiple ASRock X10 or G10 routers through the ASRock Router app. The ASRock X10 is a true smart home automation hub. Thanks to the use of ZigBee, the ASRock X10 is able to control a multitude of Smart Home devices in a mesh network. This includes smart LED bulbs like Philips Hue bulbs and GE smart bulbs, Securifi smart plug, leakage and door sensors, and Samsung SmartThings Outlet. The ASRock app for the X10 also offers geofencing functionality, which allows location-based triggers commands to, for instance, automatically enable security sensors once you’re away from home, or turn on lights when you arrive home at night. The integrated IR transmitter uses a cloud-database to give your smartphone control of any IR controlled devices in your home, or the X10 can learn your devices IR codes by learning from your remote control. This, for instance, allows you to use your iOS® or Android™ device as a remote control while not being physically present in the same room as the device you want to control, like heating, air-conditioning, television and DVD player. The ASRock X10 is a fully functioning VPN server, which allows you to securely connect to your home network through L2TP, IPSec, and OpenVPN and the AES128 encryption standard. With transnational control, you can access your files and devices at home, including USB devices connected to the X10, from anywhere in the world thanks to its advanced M2M (machine to machine) technology. This allows you to stream your music and movies or watch TV shows you recorded at home. It also gives you complete control of your home when you’re away, for instance, you can easily access your IP security cameras in your home to check if everyone is okay and, for instance, remotely adjust your air-conditioning for your pet on a hot summers day.